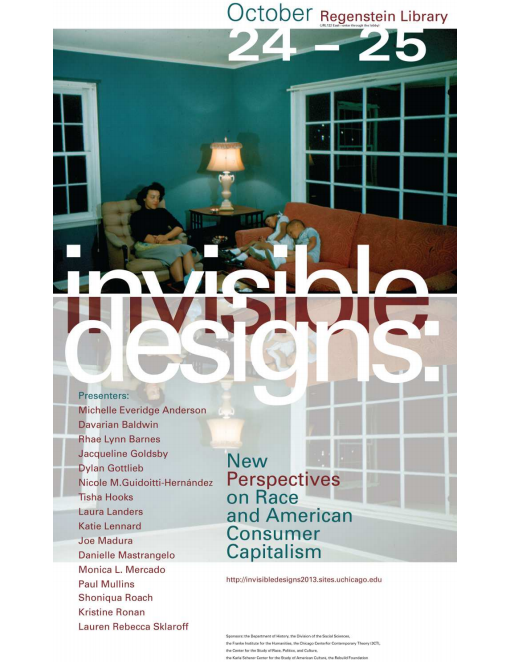 Invisible Designs – Monica L. Mercado, Ph.D. This conference takes design as an object and a theme to gain new perspective on the study of race in American consumer society. How has racialized imagery sustained the work of capitalism and American dreams of the “good life”? Considering design in relation to problems of self-fashioning, material culture, immigration, urban and suburban development, and decorative commodities, we will engage with the latest scholarly conversations about race and capitalism and explore paths for future inquiry. Ultimately the conference aims to uncover the otherwise “invisible” cultural logics and historical processes that have woven racial difference into the fabric of American life. I’ll be presenting some preliminary research on first communion portrait photography and the material culture of Nuyorican migration as part of the panel “Life Design” on Thursday morning, October 24. The conference and related exhibition, “Race and the Design of American Life,” will take place at Special Collections Research Center at Regenstein Library.